Following up last week's post about the Kapoor family tree, here is an article from Filmfare (December 4, 1970) with a few recollections about Raj and some text descriptions of some of the family relationships (branching out all the way to actress Naaz, who married Prithviraj's nephew)! 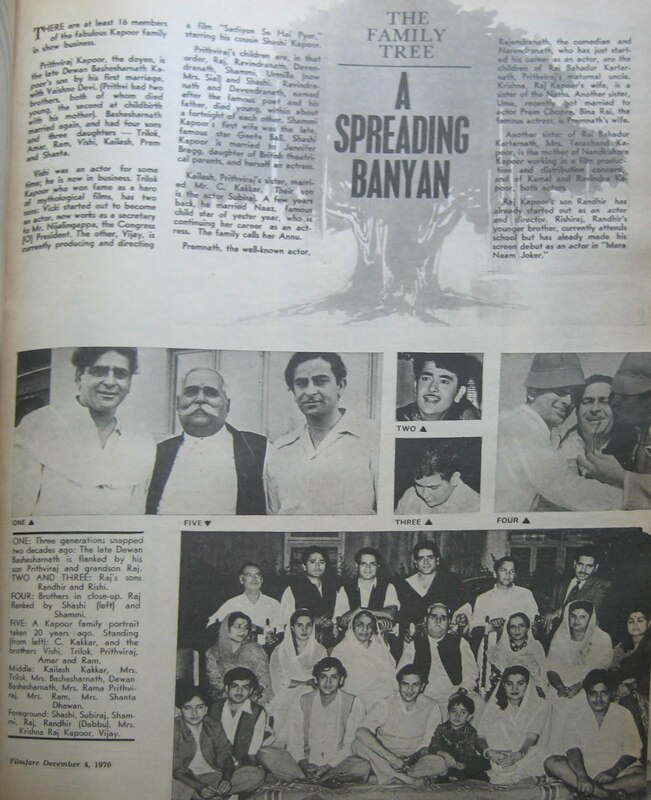 Note the little picture of young Rishi and Raj with Shammi and Shashi hamming in silly hats! 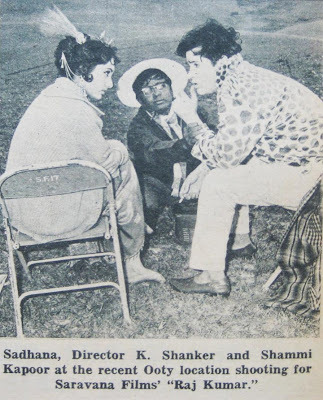 Shammi in an amazing shirt while filming Rajkumar! Sadhana's headpiece is no less amazing. 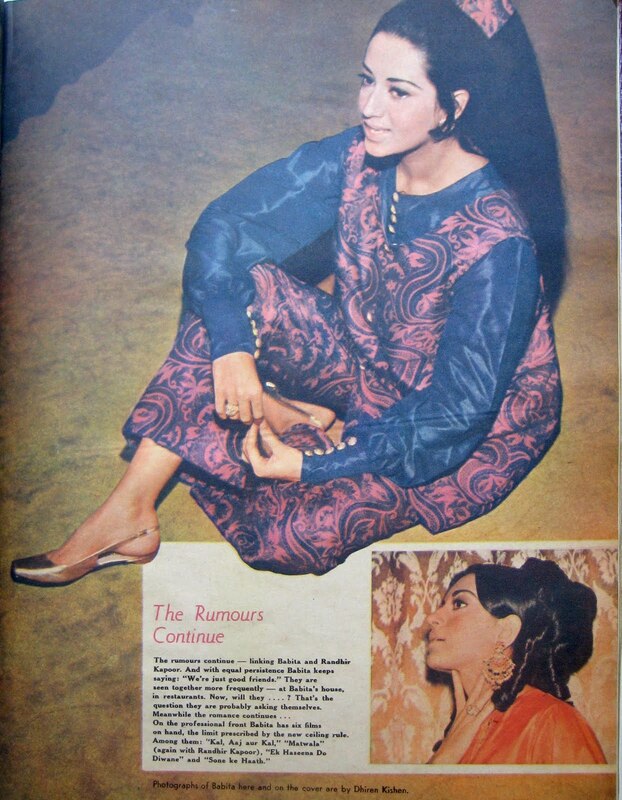 Babita wearing something I want to steal, head to toe. I'm not saying I'd wear all of it simultaneously outside the privacy of my living room. But I want it anyway. I really wish they'd done more films together - I like them so much as a pair. 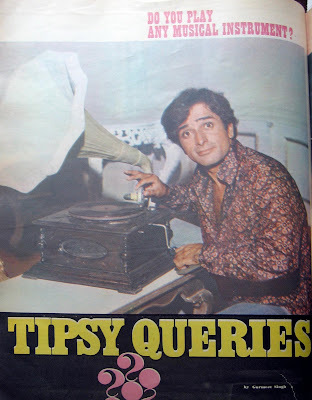 And Shashi in the regular Filmfare feature "Tipsy Queries." 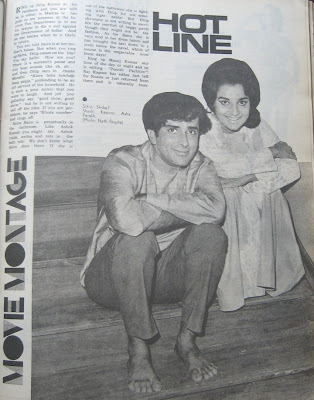 I found two more of these with Rekha and Bindu (I promise to share them later). So silly! Shashi Kapoor as a paanwala! He'd mint money, wouldn't he? Even now. I'm in love with Tipsy Queries! Can't wait to see the Rekha and Bindu editions, and any more, if you track them down. They should totes resurrect this feature. (my verification word is "nidli" which makes me want an idli. 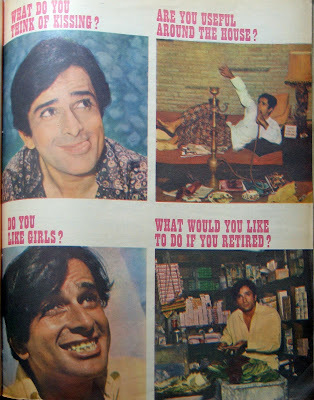 @ bollywood deewana: one can interpet his facial features in different manners. 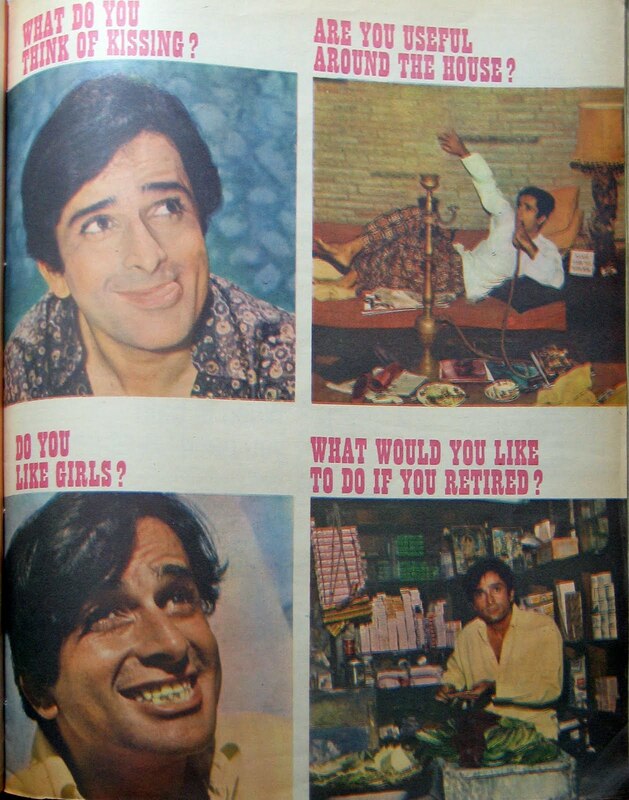 I remember an interview of his from late 80s, where he says "Why does everybody ask me about interesting women? I could tell you about some intersting boys". This is not a word-to-word quote but something on these lines. As I read that my jaw reached the cellar! But naturally, that could mean anything! But returning to Tipsy Queries: the very fact that they ask such a question makes me wonder. 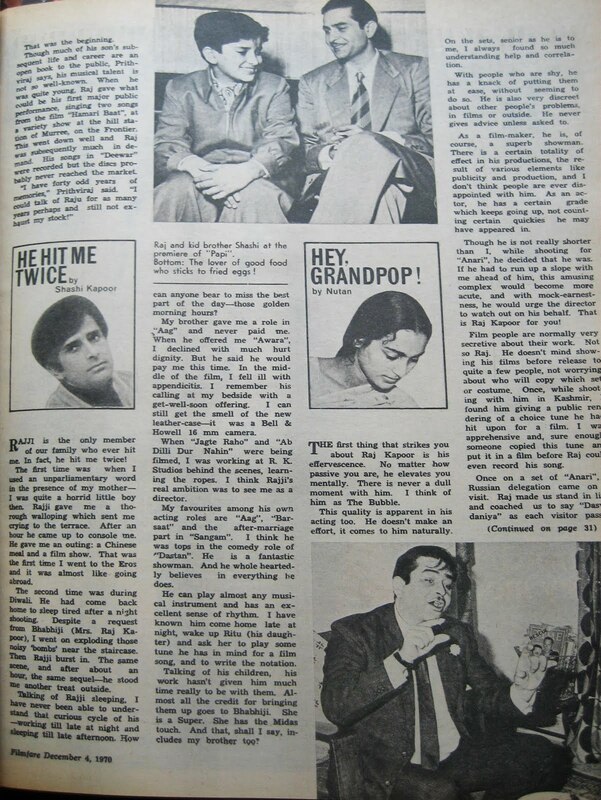 @ beth: Saw all the Kapoor Khazana and am floored. THANKSSSSSSSSSSSSSSSSSSSSSSSS! I meant naturally access and not excess. my fingers are getting rusty and my brain is getting hollow! Enjoy seeing these old photos. 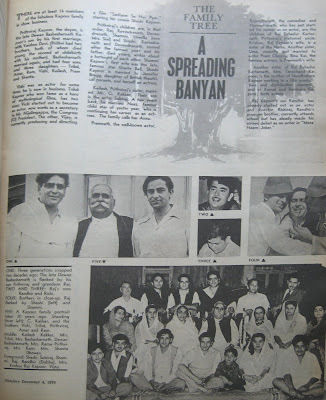 "A Spreading Banyan" ??? Really??? Good Lord, for that alone the magazine is worth it!